"They had rules about what colour those huts could be painted, you know"
Next to the Jakobsberg, Mr Monkey saw a woman in 19th century costume walking past the Hazelhuis Mansion. 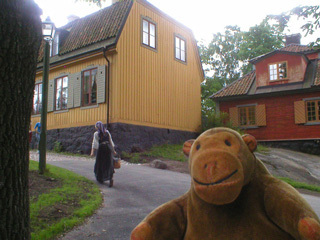 Artur Hazelhuis, inventor of the Skansen and the Nordiska Museet, was born in this house in 1833 when it was somewhere else. 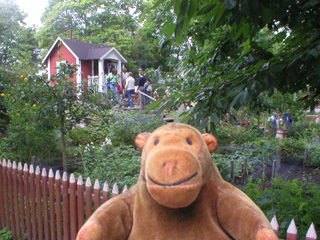 A little further along Mr Monkey spotted a 1920s allotment hut from the Tanto district of Stockholm.